A tractor trailer driver suffered serious physical injuries as a result of an accident earlier this month in which his truck hit a barrier on a Florida interstate highway and fell off an overpass onto the roadway below. However, he has now suffered financial injury as well, having received a ticket for using his cell phone while driving a commercial vehicle, a violation that comes with a $500 fine. According to reports, authorities obtained the information about the trucker’s cell phone usage immediately prior to the accident from dash-cam video. In Florida, the law pertaining to texting and driving is quite clear and leaves little room for misinterpretation. Known as the Florida Ban on Texting While Driving Law, its purpose is to make Florida roads safer for everyone who uses them and to cut down on and even prevent injuries and deaths resulting from using a cell phone to text while behind the wheel of a vehicle. The law includes language authorizing law enforcement personnel to issue citations for this illegal practice when they have stopped drivers for other traffic violations and clearly states that, aside from a few specific excluded circumstances, using a cell phone to send or read text messages while behind the wheel of a moving vehicle is prohibited. It is hard to argue with the facts, and when it comes to facts about texting while driving, facts abound. Texting while driving has become a problem in our society as we grow ever more dependent upon, and even addicted to, technology. It is not just a young person’s issue, either – adults and young people alike are performing these dangerous activities, and an even though an older and more experienced driver may not have quite as high an accident rate while texting and driving as a younger and less experienced driver, it only takes a few seconds for that record to be shattered. 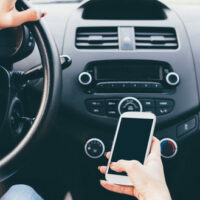 The statistics of accidents that involve cell phone usage climb each year and, despite laws in just about every jurisdiction prohibiting it, the problem does not seem to be dissipating. Even many of us who recognize that it is a problem do admit to engaging in this behavior despite knowing the dangers and risks. If you have been injured as a result of being involved in an auto accident, you need to know your rights and responsibilities under Florida law. Whether the accident involved bad road conditions, another driver’s negligence, or even texting while driving, you need to know the facts about how the legal system operates and what you can expect may happen with your case. The experienced legal professionals at Boone & Davis are here to help. Our Fort Lauderdale attorneys can help you to receive compensation for your medical bills, lost wages, and costs associated with pain and suffering after an accident. Do not settle for second best – contact Boone & Davis now by calling 954.556.5260 or visiting online today.